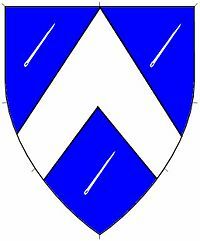 Azure, a chevron throughout between three needles bendwise sinister argent. Elena Hylton is a seamstress and general fiber arts aficionado. She adores fashion history, all sorts of embroidery, and weaving (many of her hobbies are documented on her website Elena's Threads ). Her persona varies depending on what new clothing she is most intrigued by, but most often seen in 15th century English/Italian/French, with some dabbling in 14th and 16th too. Elena Hylton lives in 15th century northern England. She has not yet married, but instead stays on at her family home. She is an avid embroiderer and sews many of her household's linens. Mistress of the Wardrobe to TRH Wilhelm and Vienna. A&S Display Coordinator for East Kingdom 50 Year Celebration. Organizer of the Canton of the Towers Fiber Arts Enthusiasts, 2015-present. Organizer of the East Kingdom Rapier Cooling Brigade, 2016-present. Senior Member of the Keepers of Athena's Thimble. Member of Arachne's Web Lace Guild. Lacing Styles 1450s-1550s A paper analyzing the frequency of different styles of lacing seen on women's front-laced gowns in Western European paintings 1450s-1550s. Finding Sources A short article detailing several ways to find useful sources for a research project. Creating Documentation for the General East Kingdom A&S Rubric A guide to using the EK A&S rubric, co-written with Lissa Underhill. Crown's Arts & Sciences, 2018 - Made King's Champion for Iron Age experiments in fiber preparation. St. Eligius A&S Competition, 2017 - winner in the research paper category. 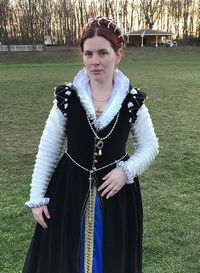 5th Annual Realm of Venus Italian Renaissance Costume Challenge, 2015 - first place, plus Best Historically Accurate Construction and Best Novice in Italian Renaissance Costuming. Please contact Doroga Voronin Non-traditional scrolls are welcome (objects/etc) 14th-16th century English/Italian/French are my most common personas, and I love period pieces. Elena is a fiber arts/research junky. She is a dabbler in lots of styles of embroidery and lace. Fashion history is a bit of an obsession of hers, with a special focus on the 13th-16th centuries. She also enjoys tablet weaving with various techniques, as well as spinning, making cord, and dyeing. In mundane life she is an academic with a background in medieval and renaissance culture. She is a huge supporter of the rapier crews The Handsome Boys and The Carolingian Calivers! This page was last edited on 22 April 2019, at 14:17.